At the start of November when the attention of most of the world was focussed on the US presidential campaign and the history making prospects of Barack Obama, another Afro-Saxon, this one of Caribbean ancestry, was speediong towards his own place in the chronicles of 21st Century achievement. And the Grenadian Briton, Lewis Carl Hamilton delivered convincingly to become at 23, the youngest and the first person of African descent to win the Grand Prix of motor racing. A fifth place finish was all he required at the Brazilian Grand Prix November 2, 2008 at Interlagos, to secure the number of points needed to take the Formula One crown for the year that the McLaren Mercedes driver termed “the most dramatic race of my whole life”. In what was described as one of the most dramatic finishes to a world championship ever, Hamilton took the title by a single point after securing fifth position on the final corner of the final lap of the final race of the 2008 season. He finished the year with 98 points, one point ahead of Ferrari’s Felipe Massa, who won his home race at Interlagos. “It’s pretty much impossible to put this into words; I’m still speechless,” said Hamilton after the race. “It’s been such a long journey, but I’ve always had the support of my family, the team, our partners and the fans. We did a fantastic job throughout the whole year and, with all the sacrifices we made, I’m so thrilled to be able to win this for everyone. Hobbies: Music, playing guitar, books, gym, cycling, squash, tennis, karting, partying with friends, chilling with family and friends, cinema, watching DVDsaccomplishment. “I am delighted that you have succeeded in winning the Formula 1 World Championship to become the youngest ever champion. I send you my warmest congratulations on your remarkable and historic achievement,” said Queen Elizabeth II in a letter to Hamilton. His paternal grandparents emigrated from Grenada to the United Kingdom in the 1950s. His grandfather (Oliver Hamilton) worked on the London Underground. His father Antyhony married Lewis’s white British mother Carmen Larbalestier (now Carmen Lockhart) and te future champion was born in January 1985. After his parents separated he lived first with his mother then his father who had been encouraging his son’s love and aptitude for racing. Anthony bought him a radio-controlled car in 1991, and Hamilton finished second in the national BRCA championship the following year. “I was racing these remote-controlled cars and winning club championships against adults,” he said. From there, Hamilton tried kart racing for the first time. Aged six, his father bought him his first go-kart as a Christmas present and promised to support his racing career as long as he worked hard at school. When supporting his son became problematic Anthony Hamilton took redundancy as an IT Manager and became a contractor – sometimes doing up to three jobs at a time to support his son’s career – and still found enough time to attend all his races. He would later set up his own computer company, as well as working as a manager for Hamilton on a full time basis. It paid off. By the age of 10 he had won his first British Karting championship. A further four British Karting championships followed in 1996 and 1997. At the age of ten, he approached McLaren team principal, Ron Dennis, at an awards ceremony and told him “I want to race for you one day” and less than three years later, he was signed by McLaren and Mercedes-Benz to their Young Driver Support Programme. After winning the British Formula Renault, European Formula Three and GP2 championship, he became a McLaren F1 driver for 2007, making his Formula One debut 12 years after his initial encounter with Dennis. Hamilton’s first F1 victory came at the 2007 Canadian Grand Prix. In his first season in Formula One, Hamilton set numerous rookie records, finishing second in the 2007 Formula One Championship, behind Kimi Räikkönen by just one point. 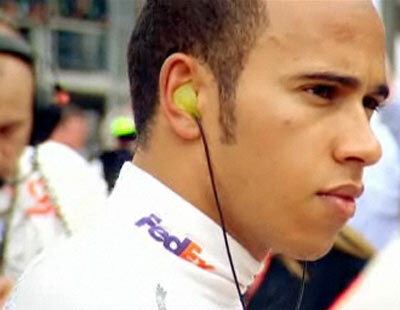 On February 4, 2008, Hamilton was heckled and otherwise abused during pre-season testing at the Circuit de Catalunya in Catalonia by several Spanish spectators who wore black face paint and black wigs, as well as shirts bearing the words “Hamilton’s family”. Supposedly this was in reaction to his rivalry with Spanish former team-mate Fernando Alonso. The FIA (Fédération Internationale de l’Automobile) warned Spanish authorities about the repetition of such behaviour and announced the launch of a “Race Against Racism” campaign. Like the naysayers did not stop the Obama train, the taunts did not do a thing to deter the Hamilton campaign.